If you want to fight for the whole point as Black, then consider playing the Benko Gambit against 1.d4. This gambit gives Black the initiative at the queenside. Study the chess strategies and tactics of the Benko Gambit and fight for a win. It is a chess opening which is part of the Benoni-Defense, in which Black offers a pawn sacrifice in return for an active setup, playing 3...b5. The original name of this opening is the Volga Gambit, but Grandmaster Pal Benko has promoted this opening, found new ideas and published a book about it in 1974, called The Benko Gambit. If White fianchettos both bishops playing g3 and b3 Black can delay capturing the a6 pawn and recapture later with Nxa6! Then White has trouble to meet the threat of ...Nb4 pressuring d5 and a2. basic position Typical setup - Black has a strong bishop on g7 which controls the center. He will put up pressure at the queenside along the half-open a and b files and will get active play there, which is supported by the strong bishop on g7. 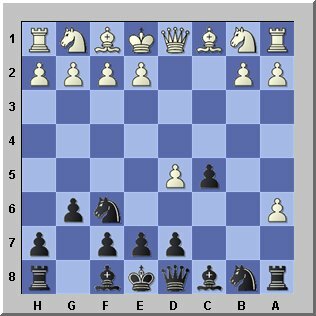 ...c4 this move makes room for establishing a knight on c5 and after that the knight can penetrate deep into the white position to d3, protected by the pawn on c4. From then on this superior knight will paralyze White completely as it controls c1,b2,f2,f4 and e5. And the queen gains power putting pressure along the g1-a7 diagonal. On the other hand white can occupy the d4 square with a knight which might penetrate to c6. ...f5 This move attacks the pawn formation e4,d5 in the center but is recommended only in the endgame as this move weakens the black kingside which might have bad consequences. 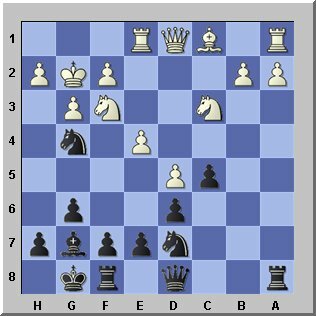 ...Nf6-g4 (Ne8 or Nd7) The black knights position on f6 has to be improved as it blocks the g7 bishop. Move it to g4 and then to e5! After that you can exchange it for the enemy knight on f3 or move it to a vital center square like c4 or d3 if possible. ...Qa5,Qb6 or Qc7 The Queen should remain at the queenside and might go to b7 to put pressure on the center pawn d5.